But My Bird Gets Everything He Needs! For some parrot owners, it can be confusing when their companions make life difficult given the great lengths that are taken to provide a varied diet, clean, well-stocked cage, and warm, loving family in a safe home. But what a toddler might see as gentle and nurturing, a parrot may see as an inalienable right, even if he has been rescued from a situation severely lacking in one or more of these areas. Further, there is little contiguity between the food in his dish and the behavior he executes when around the family during playtime, and many confounding variables in between. 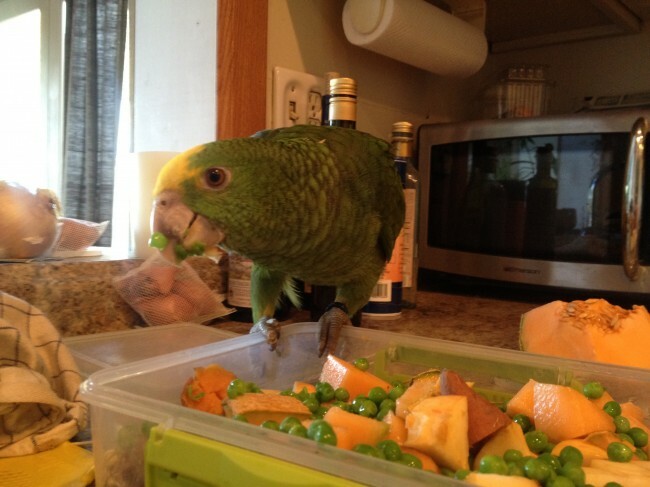 All of these components are very important for the health and behavioral well-being of a companion parrot, but it is vital to remember that they aren’t the only things. Often the primary care-giver of the bird expresses hurt feelings when the bird favors another person in the household, or even shows aggressive behavior such as lunging, biting, or aggression displaced on to toys or cage accouterments. This is where developing skills to observe how our interactions are perceived from the bird’s perspective can offer guidance. If cleaning the cage and changing food bowls bring about stressful interactions and excited behavior, what can we do to prevent or replace the undesired behaviors that are influencing the way the bird behaves with us in the future? foraging toys first. The initial step is to make it really easy for them to find their favorite goodies in a box or paper bag hanging in their cage, cutting out a hole so that they can easily see the extra special treats inside. The foraging item gradually becomes more complex, with newsprint or tissue paper stuffing added inside, the hole getting smaller to non-existent, encouraging more chewing and ripping. 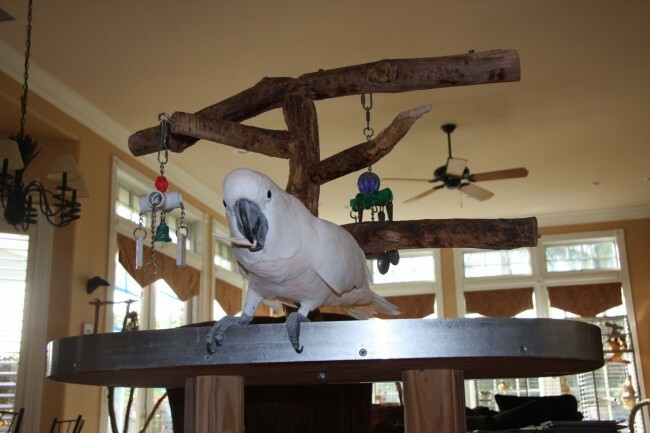 And once this behavior becomes fluent, different materials can be added inside and out for the parrot to tinker around with. 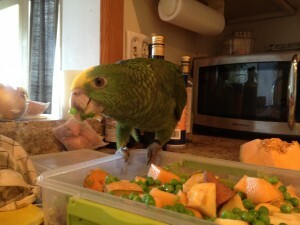 This technique has helped many a parrot go from perch potato to toy-playing enthusiast, which, again, leads to more appropriate behaviors and a healthier lifestyle. 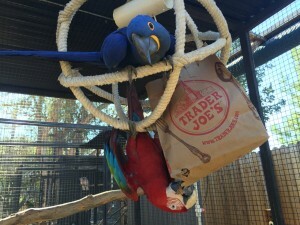 One of the management tactics often seen in companion parrot households is the three strike rule, whether the problem is a squawking bird or one that keeps climbing off its cage or playgym. The owner gives the bird two warnings before finally putting an end to the behavior by covering the cage, banishing it to a far room, or taking it off the gym and locking it up. Of this technique’s success in the human penal system, from the rumpus room to the courtroom, I know not, but when dealing with parrots, we are missing an opportunity to offer them clear communication to support successful behavior and avoid a lifetime of the chasing problem behavior. If we break down our responses from the bird’s perspective when “warning” them or using the three strike rule, what we might actually be doing is reinforcing the problem behavior each time we respond to it, whether we are speaking to the bird, walking over to pick up the little floor wanderer, or going to cover the cage. Unlike a toddler, the bird doesn’t understand humanese, so it matters not what we say or even how stern, unpleasant, or displeased our voice sounds, the fact that we respond at all could very well be what keeps that behavior going. If, in most cases, responding to the problem behavior reinforces it no matter what, ignoring it can be difficult if not impossible (think of a toe-grabbing cockatoo on the kitchen floor!). Once again, establishing consistent solutions based on prevention and replacement, for instance finding out how to adorn the bird’s playgym with enrichment and offering periodic social reinforcers so that it has no need to climb down, will provide sustainable solutions that alleviate a tremendous amount of stress in the household. 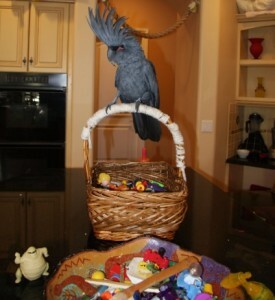 A black palm cockatoo with a basket full of toys to keep her busy. There is some critical value in comparing our parrot companions to toddlers that never grow up: it helps potential pet owners understand the commitment it takes to maintain a happy, healthy, intellectually-stimulated parrot in their homes. That said, to take this comparison to another level and use it to describe the mental capacity of a parrot as it relates to that of a child is unfair to both species. They are each capable of vastly different modalities and thought processes, of which scientists are continuing to uncover and use to rewrite textbooks. Treating birds like children can – at best – lead to misunderstandings and hurt feelings, but often creates extremely difficult problem behaviors that leave humans with ineffective tools to fix them. This entry was posted in Problem Behaviors. Bookmark the permalink.